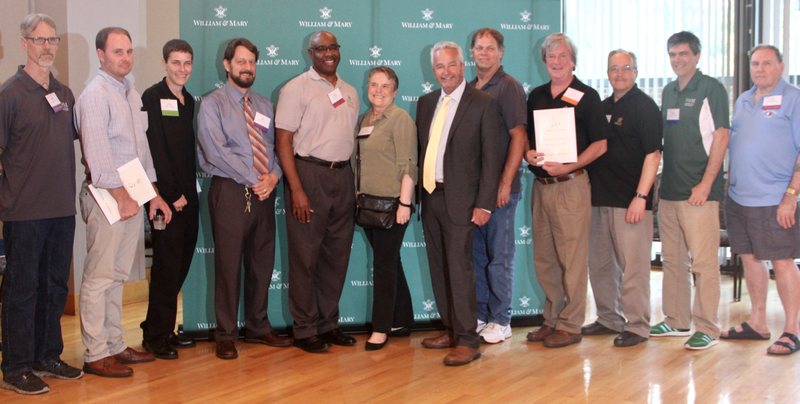 William & Mary honored sixteen IT department employees at the 2018 Service Awards ceremony on Wednesday, June 13. 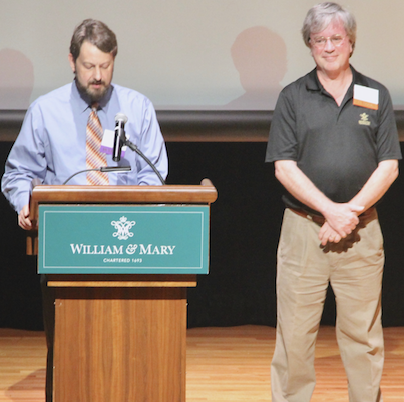 They were recognized for their continued service and longstanding commitment to the College. Four of those who were recognized have served 25 years or more. Those four are: Lee Conder, Dave Shantz, Wayne Farnsworth, and Mike Ribeiro. Classroom Support Specialist Lee Conder was honored for his 40 years of service. John Drummond, his supervisor, took to the podium on stage to commend Conder’s long-term dedication to the College and its students. Conder started working at William & Mary in 1977, operating the IBM Mainframe computer. “Working the night shift in Jones Hall for 25 years, (Conder) trained countless students on the IBM Mainframe,” Drummond said. 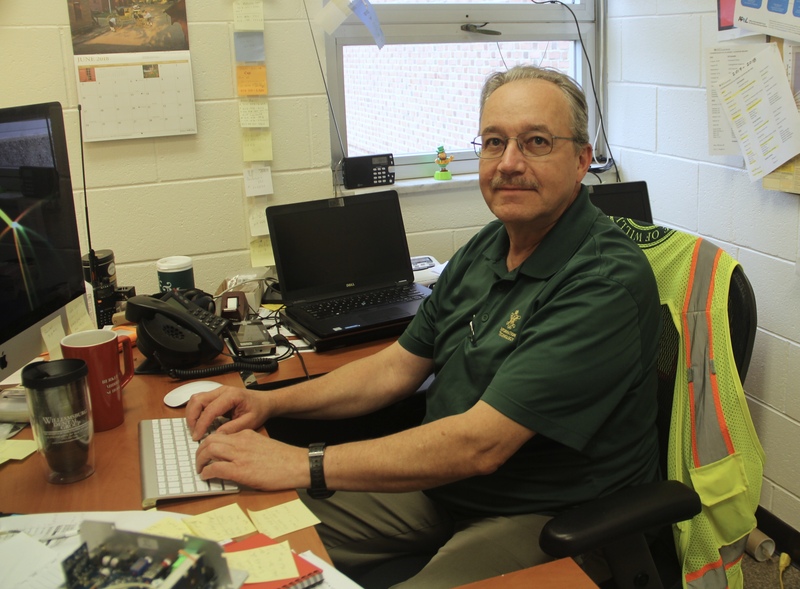 Following 32 years of service to the College in Mainframe Computer Operations, Conder joined Classroom Support. Conder grew up in the Denbigh section of Newport News; the shipyard and watermen served as a constant reminder that he lived on the water. He spent several months working at the Newport News Shipyard as a welder and then two years at Noland Company. He now resides in Williamsburg with his wife (and William & Mary graduate), Mary Esther Cottrill. He enjoys walking to work and he is also a happy boat owner. Video Conference/CATV Engineer Dave Shantz was honored for his 30 years of work. Early in his professional career, Shantz worked in several aspects of construction as a surveyor, TV & electronic repair technician, and as a quality control engineer for General Electric. Shantz continued his career at Virginia Tech prior to joining W&M in 1997. He assumes primary responsibility for both the CATV system and Video Conferencing as well as general troubleshooting for Classroom Support. In his spare time, Shantz enjoys sailing, birding, and tinkering with amateur radio. Shantz believes IT provides one of the best areas to work due to its variety and depth and its interaction with other departments. He says that William & Mary is a very rewarding environment that allows him to work with many amazing people. Senior Networking Installer Wayne Farnsworth celebrated 25 years of service. Following his high school graduation, Farnsworth, a West Virginia native, joined the United States Marine Corps. In 1989, he moved from West Virginia to Williamsburg and started as a contractor at the College a few years later. Farnsworth is certified in fiber optics, which enables him to splice and test wiring and equips him to troubleshoot problems. Farnsworth says the favorite part of his job is working both inside and outdoors. When the weather is dreary, he tends to work indoors. On nice days, he is outside ensuring that wiring and equipment is being installed in accordance with code and regulations. 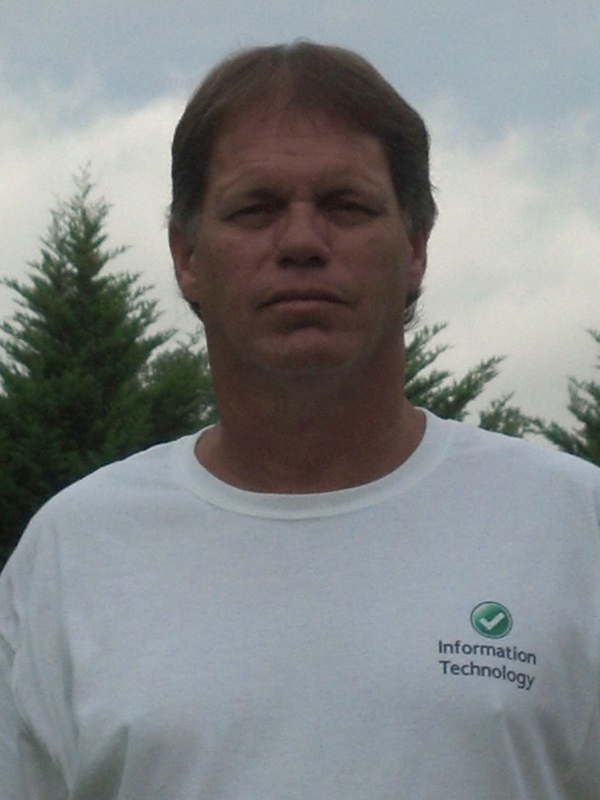 He also enjoys working with the great IT staff and meeting personnel from other departments. Also honored for 25 years of service was Business Intelligence Analyst Mike Ribeiro.